It is indeed an auspicious occasion, and I am very grateful to have readers and followers of the blog, on this writing and publishing journey with me. Thank you for the support in this first tentative year of getting my words out into the public domain, taking shaky steps into the challenging technological space that exists as a stage without a visible audience, as I slowly build the jigsaw of my memories, my life story, things I have learnt, and my thoughts along the way. Thanks, WordPress, for making this worldwide platform possible. 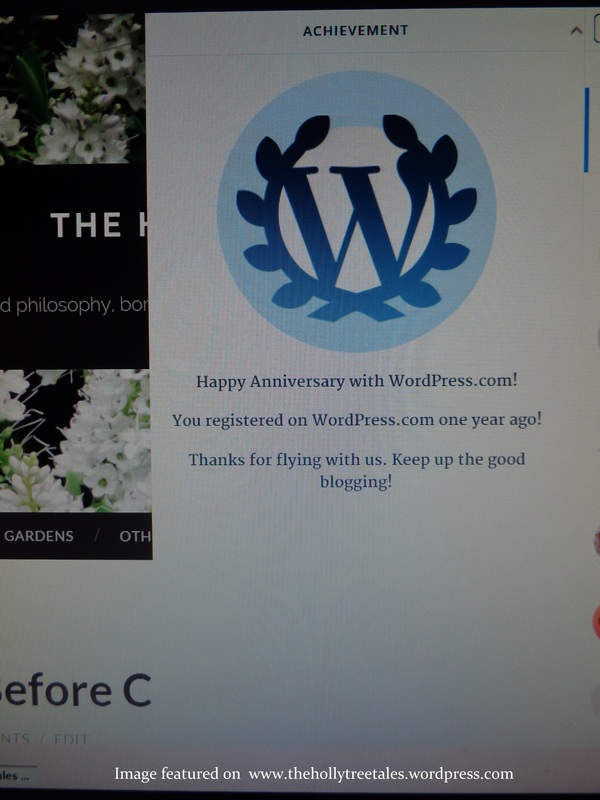 With over 100 posts now logged, the first year of novice ‘blogging’ has held many lessons, many moments of confusion in the writing and technological process, and multiple blessings have come my way too. May the second year of this particular journey reap even greater rewards, with the basic blog site’s structure now (almost) all in place, building on that which has been created thus far. I look forward to seeing the writing reach its zenith, as well as a wider audience, this year! Every small step is a step in growing confidence and validation for that already hard won. Thank you, everyone, for the great encouragement to keep ‘blogging’. I am very grateful that the work here is so valued.